Reynolds Woodcock is one of the most renowned haute couture dressmakers in all of fifties London. In the world. He’s revered, worshipped, spending every waking hour conceiving and overseeing the manufacture of the finest bespoke garments. His gowns are sought by the highest in society. By landed gentry, by royalty even. The pressures of such high esteem require the letting off of steam, naturally, and on one of his recuperative trips to the coast, he’s beguiled with the nervous waitress clumsily serving his cream tea. Taking her under his wing, yet keeping her awkwardly distant, their relationship remains stiltedly …vague. Is he infatuated with Alma (Vicky Krieps) herself, or just her potential as a model? Could she be the perfect living mannequin to exhibit his unique creations, yet nothing more? Alma moves into his London townhouse in fashionable Fitzrovia. It’s just the two of them. Well, the two of them and his legion of house staff. And ranks of seamstresses. All of whom are under the domineering shadow of Reynolds’ big sis, Cyril; a magnificently precise performance of clipped pedantry from Lesley Manville. Seeing beyond the facade of his fearsome reputation, Alma falls under his spell, but is soon getting snagged on his exactitude, his intolerance, his… control. She’s desperate to get close to the real man, but kept at bay by a shield of constant work, and his overprotective sentinel of a sister. Feeling hopelessly hemmed in, she decides to take matters into her own, laced hands. This is a multi-layered, finely trimmed creation of needle-sharp accuracy that hooks you in with exceptional elegance. As meticulous as one of Woodcock’s patterns, it’s a beautifully judged knitting together of acting craft and visual flair, with a plush piano refrain running through the seams. Sublime symmetry self-consciously pleases the eye, most thrillingly in several unnervingly kinetic motor car jaunts. The tale gathers into a statuesque drama where the plot must be gently teased out, before it slowly, inevitably, begins to unravel. The lead role is a tyrant again, no doubt, but one cut from a different cloth to There Will Be Blood’s overblown oilman Daniel Plainview. Buttoned-up, waspish, broiling away beneath the grace, he always seems one dropped stitch away from the ridiculous. But the subtlety of Anderson’s work pays dividends most on retrospection. Multiple weaves are embedded in this yarn once you begin to pick at it… The psychological shortcomings in those blessed with ‘brilliance’. What it takes to prick the ego of the inspired in an attempt to get close. That some relationships might only work in ‘dysfunctional’ style. And who’s to judge what is dysfunctional if it works for both partners? Not every love story can be tailor-made to fit perfectly, after all. An exposé of male exploitation? Of the human cost so often found behind great art? A paean to the power of the muse? A swansong to Day-Lewis? Some form of veiled apology? 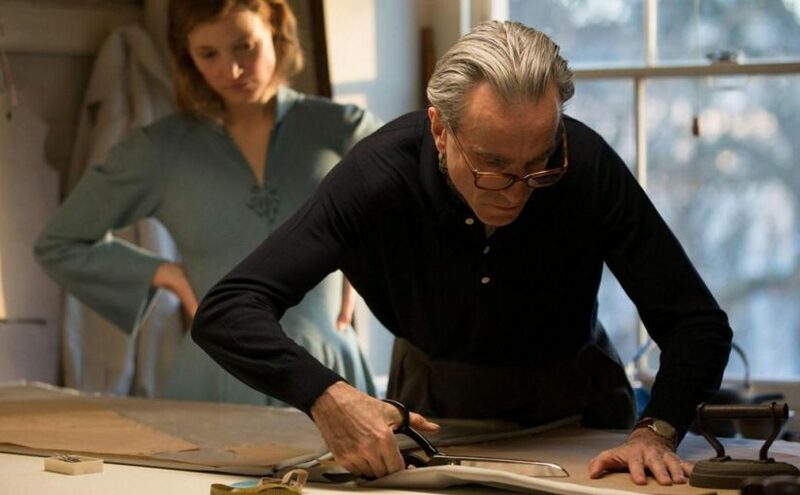 Phantom Thread even dares to question if deliberate harm could offer benefit to those craving some sort of ‘healing’. This refined, enigmatic, and finessed delight, skirting such dark strands, pondering the deeper creases of life’s fabric, proves to be thoroughly gratifying, and uncommonly thought provoking. A made-to-measure way for such a consummate actor to bow out. Before he hears, for the final time perhaps, “cut”.